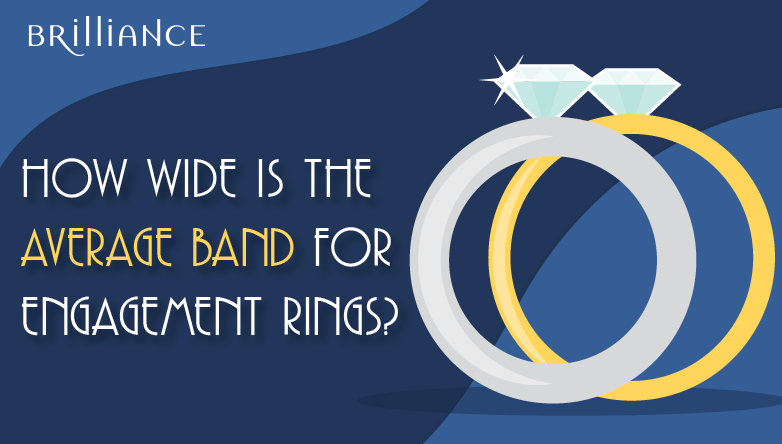 How Wide is the Average Band of an Engagement Ring? Rings come in all shapes and sizes, but many brides wonder just how wide their engagement ring band should be—especially when it’s paired with a wedding band. While there is no ideal width for engagement ring bands, the details and designs of the ring, the carat weight of the center stone, personal preference, and finger size can all factor into choosing the perfect band width. Keep in mind, however, that ring width is measured in mere millimeters—increments small enough not to make a noticeable difference to some. For others, however, even the slightest jump in width can make a fashion statement. While the width measurements for rings range from one to 20 millimeters, most women will wear bands that measure between 2 and 6 millimeters. To help you choose your ideal width, here’s a breakdown of different size bands and the popular pairings of each size. Engagement rings with band widths between 2 and 2.5 millimeters appear delicate and very thin. Smaller bands don’t leave room for many details and designs, but these bands look extraordinarily romantic with smaller solitaire diamonds. Thinner bands also stack well with a dainty wedding band of a similar width or even with a bolder or chunkier wedding ring. Avoid placing large diamonds over two carats on a single, 2 mm band, as this actually makes the setting less secure and could result in a lost diamond. Instead, some engagement rings actually feature two or three thinner bands to hold a larger solitaire diamond. Delicate bands are easily overwhelmed, though, when supporting a multi-carat center diamond. If you want a large solitaire, opt for interlocking smaller bands to balance the heavy solitaire. 3 to 4 millimeters is the average width of an engagement ring. Not too thin, and not too wide, the band allows room for gemstone and diamond details. The slightly larger width also creates a more spacious canvas to integrate filigree details or laser designs. Feel empowered to choose a diamond of any shape and size for your center stone, as this band isn’t easily overwhelmed or overpowered. However, when choosing this width for your engagement ring, be sure not to go too wide for your wedding band…otherwise, the rings may overwhelm your finger. Choose a wedding ring that is of similar size or even smaller for the perfect pairing. Thick and hard to miss, go with a wider band engagement ring if you want lots of engraved details, gemstone additions or a hefty solitaire center stone. This width ring looks best when worn solo, as its size may overtake a wedding band. If you really want to pair it with another band, choose the tiniest sliver of a band to display at its base. This band size also looks incredible when used as a channel setting with a large solitaire stone. While women may choose wide bands that measure beyond 6 millimeters, going wider is not for the faint-hearted. Rings over 6 mm in width are more common for statement pieces and anniversary jewelry. Finally, consider your ring size. For some brides, finger size also plays a part in choosing a band width. More diminutive fingers might be overwhelmed by wider and heavier rings. Longer fingers or bigger hands can opt for wider widths and heftier designs. You may want to scale down or scale up your width depending on the size of your fingers. Remember, accessories should mesh with your personality. So listen to your own inner fashionista voice when choosing the width that works for your life and your unique style. Every engagement ring reels in attention, but the bigger and bolder you go, the more visually obvious the ring! Consider your options, and choose your ideal size!